We are so excited (when are we not excited, right?) to announce our latest event! LADIES, we want you to try your best to make it out to our discussion forum called Girl Talk. The topic of our forum is Wounded Hearts: Healing Our Wounds. A panel of women will be discussing many common issues among women today – such as; interpersonal relationships, forgiveness, parenting (single or otherwise), love, self-esteem and more. But, this will not be just a bunch of women talking, we hope to see some real solutions to some real problems. We will use God’s Word to provide the deliverance and healing of the wounds. Christian Comedienne Tanya Lewis will be providing some much-needed laughter during our intermission, as laughter is good for healing the soul. Won’t you join us? 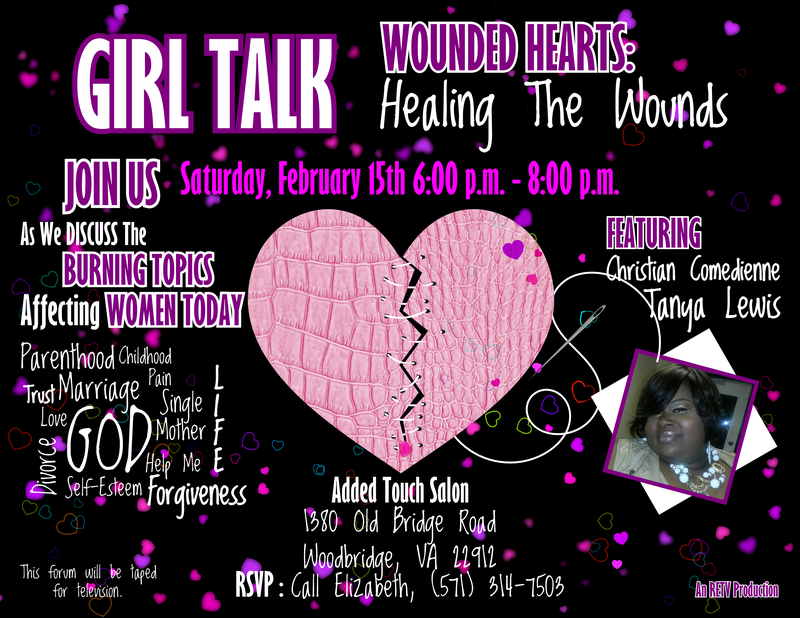 We invite you out on Saturday, February 15th from 6:00 p.m. to 8:00 p.m. at the Added Touch Salon at 1380 Old Bridge Road, Woodbridge, VA 22192. To RSVP for this event, give Elizabeth Charity a call at (571) 314-7503 or visit the Youth Outreach Services Facebook page, the event will be posted there. Seating is limited to 40 people, so don’t delay. This entry was posted in Community Outreach, Events, RETV and tagged christian life, Community, Women's Ministry, Women's Outreach. Bookmark the permalink.